Outfits with Faux Fur Coat. Winters always bring about a great change in the dressing and fashion trends. It is always much easier to experiment with different styles and opt for much brighter and bold clothing and colors. Probably that is one reason women love autumn and winters so much. One of the most stylish and an easy way to look and play around with your style is to wear a faux fur coat. Many women are hesitant to carry it as they don’t know much about how to do much with it. 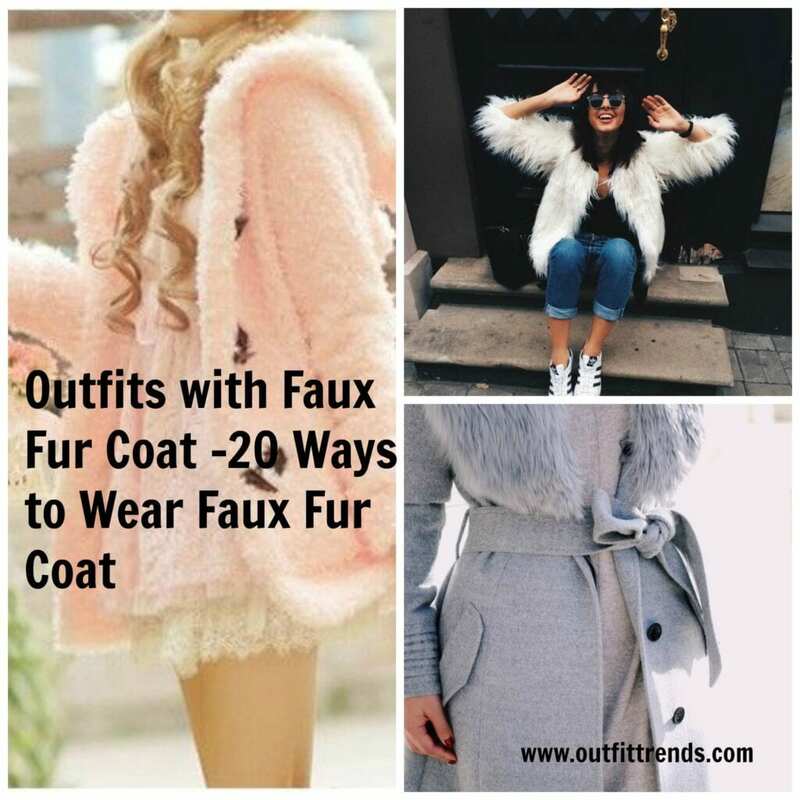 So here we are, providing you with 20 looks and styles on how to wear faux fur coats and how to carry them throughout winters. Women who want to go for a statement look can wear animal skin textured faux fur coats. Everyone simply loves black, so why not opt for a black faux fur coat? It is simply the easiest way to pull off anything worn along the coat. Since Fall is all about bold colors, why not a bold color for the faux coat? This not only looks sophisticated but also gives an edgy look to the personality. A long neutral colored faux fur coat can be pulled over skinny pants and a simple top. Winter means keeping yourself warm; go for a combination of cashmere and faux fur coat. You can also add casual look to yourself while wearing a faux coat, pair it with sneakers and denim. How amazing does Olivia Palermo look in her Faux Fur Coat? For a formal event wear a sleek dress and long boots and pair it with a fur coat. Even for winter wedding faux fur coats are a great option. Wear a similar colored furred coat to complete the look. An absolute chic look can be obtained if the faux fur coat is combined with a contrasting hat. Not many women are willing to experiment and spend on very bold dressing but if you can pull off a multicolored fur coat then you can pull off anything! Wear a faux fur coat on monochrome dress code. Rainbow colors are cute, and so will they look when worn as faux coats. To make your style look everyday street style, wear a long faux fur coat instead of the shorter ones. For a sleek look wear a vest faux fur coat on a skinny dress. White is forever classic, then why not go for a white coat? Ever thought of wearing a coat over a cocktail dress? Well go ahead and try! Mufflers and coats are most favorite combo in winters, for an effortless yet stylish look.